My amateur radio callsign in use nowadays is M1BXF but was first licensed as MM1BXF and have also been active as OK8BXF when I worked in the Czech Republic, Pardubice, for a few years but now you’ll regularly hear me operating from my 2nd shack Flossie with the local club call G3PYE in the RSGB V/UHF activity contests (UKACs), or some variation of my own call (FP/M1BXF for example) or that of G3PYE (e.g. GS3PYE). When operating my main interests lies in VHF/UHF weak signal digi modes, I’m a big fan of WSJT and modes which allows activity on bands above 30MHz without major enhancements. I usually monitor 50.230 JT6m or 50.325 ISCAT (tropo) and 144.370 FSK441 (meteor scatter) when in the shack. If there is a lift on I’ll be in the SSB segments of 6m, 4m, 2m or 70cm; to keep an eye on such activity I modify all my radios to tap the IF out so it can be monitored on an SDR allowing large bandwidths to be monitored, and monitored silently while I do other things in the shack. I can also be found using the ON4KST chat page if you want a sked and if the moon is up then it’s possible I’ll be lurking around the EME segment of 2m and on the JT65 EME chat page. 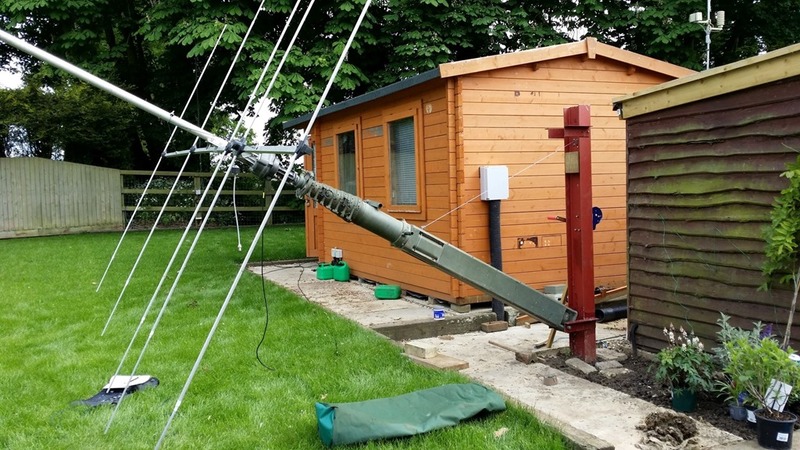 I’m currently serving as the technical coordinator for the Cambridgeshire Repeater Group (CRG) which operate 11 amateur radio repeaters in the Cambridgeshire area with plans to develop and increase our capabilities. I’ve been heavily focused on the relativity new digital mode D-Star having got the D-Star repeater GB7PI on air in late 2007. I have written many D-Star related articles for the UK national ham radio organisations magazine RadCom, featured in the RSGB Radio Communication Handbook (section 9.3) and have done more than 20 D-Star presentations both locally and nationally. Alongside the CRG I’m an active member of the Camb-Hams who are a bunch of enthusiastic hams around Cambridge who do things instead of talk about it. We have been making regular trips to Ham Radio Friedrichshafen each year since 2008, attend a radio rally in Belgium (sometimes activating a SOTA summit (video) on the way), take a weekend ferry trip to Holland in March to attend the Dutch VERON National Rally Flea Market at the Autotron near Rosmalen. In addition to all that we all head off on at least 1 DX’Pedition per year, I also try and go on another one with the CUWS. I’ve been lucky in that I’ve always had a decent shack in which to operate from. Whether my passion for electronic design and modification of equipment has naturally led this to happen or the other way I’m not sure but I really encourage anyone with an interest in the hobby to make a stance and claim a space dedicated to your hobby, it makes it much more enjoyable. I’ve tried operating out communal spaces, during house moves, and it has seriously dented my enjoyment and engagement of the hobby. My shack is an Avon 400 outdoor log cabin / office from a company called Dunster House, and is just under 4m x 3m inside. Here is what it’s like on a typical day (click to open a larger version in Flickr). You can see my design which is kitchen worktops on the right and back as you look at the image and a small 1m length on the back left (before the cupboards start). I use full-sized and half-sized kitchen units to keep the desk secure, also great for storage. I say it’s just under 4m x 3m now as during the re-build at Woodditton I added insulation, couple that with new wall boards means I’ve lost around 35mm on each wall, or 7cm in each direction. You can see photos of the build on Flicker here. 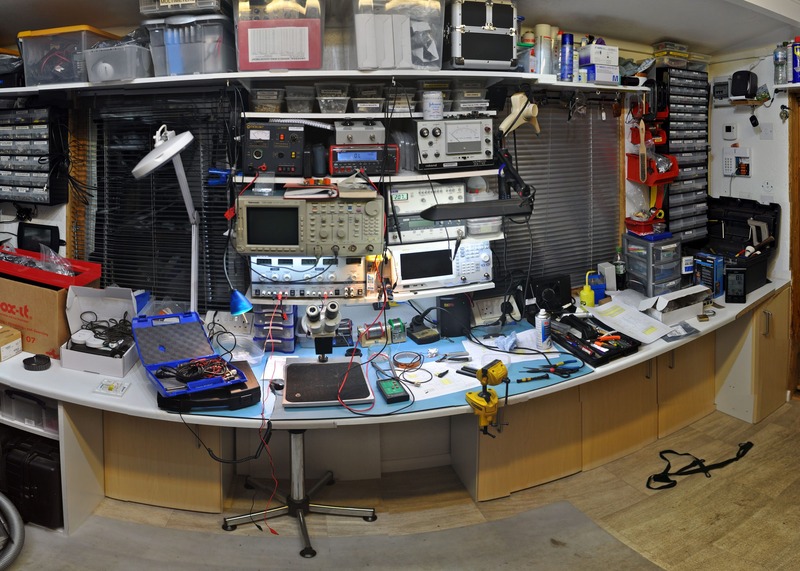 I’m very much into construction of electronics “things”, and this turns out to be the most common activity I do in the shack. 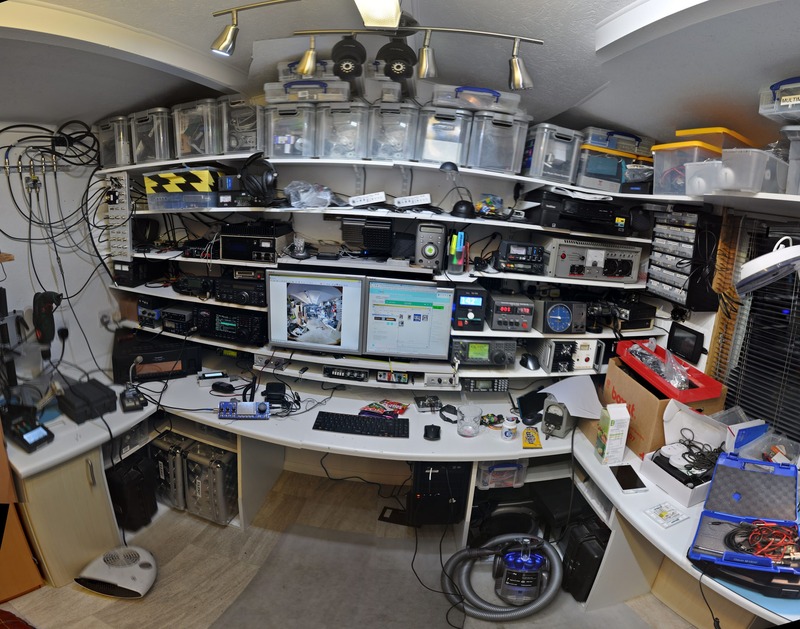 As such I’ve built up a reasonable workbench and sets of tools to help me pass the time this way (again click to open a larger version in Flickr). And finally to the operating end of the shack. The basic layout here is HF on the left and VHF on the right. The shelving allows for easy configuration of accessories like PSUs, amplifiers, power meters and the like. The PC monitors sit in the middle. You can see storage at the top, the coaxes coming on from the left and the start of the construction bench to the right. 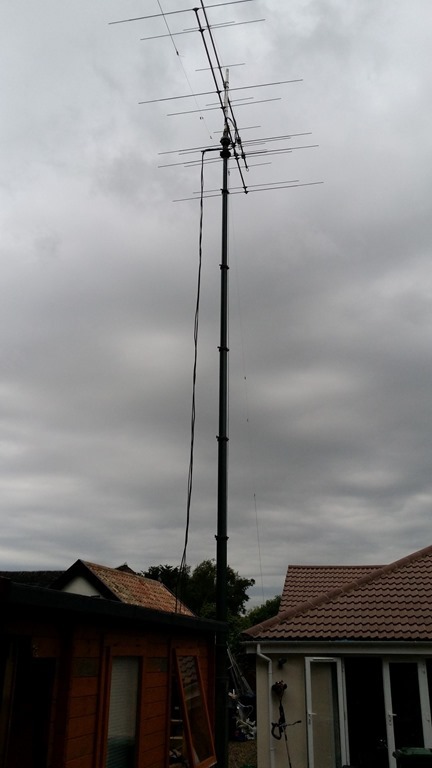 This is the main SCAM12 which has the VHF antennas for 6/4/2/23cm on it (23cm not shown in this photo). 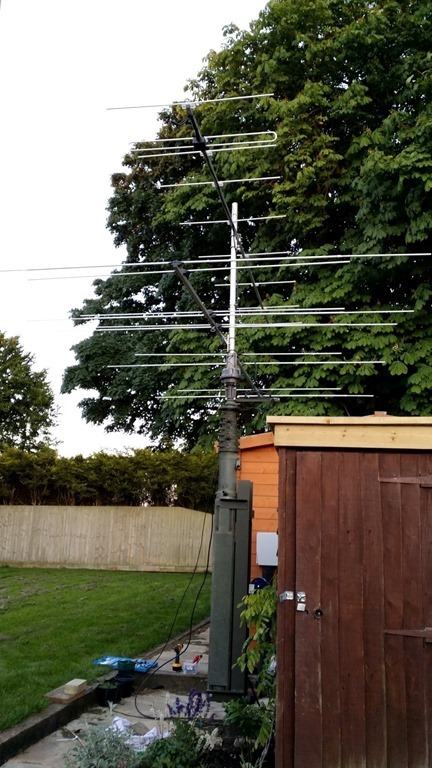 Shack with SCAM12 with 6/4m & 2m . 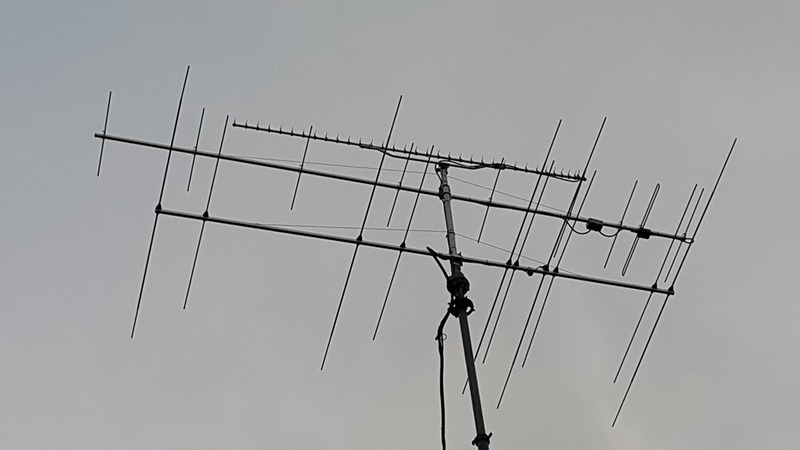 Here are the antennas with 23cm fitted. The great thing with the SCAM12 is when it’s down it’s low, here you can see the antennas down at around 2.5-3m, at this height you never need worry about windy night again! I made the mount for my SCAM12 such that I can tilt it over if I wanted to work on antennas. Base of SCAM12 tilting over. 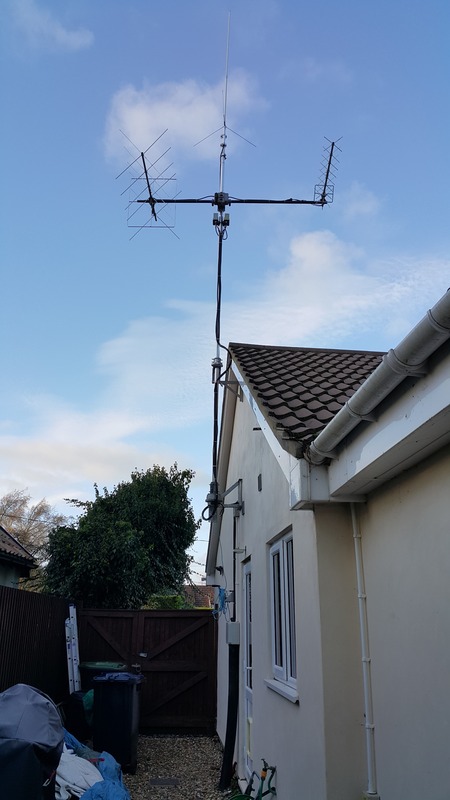 In October and November 2015 I was able to get my satellite antennas back up. This uses a pair of Berenco wall mounts, the lower one a tilt-over variety. 2m and 70cm satellite antennas. 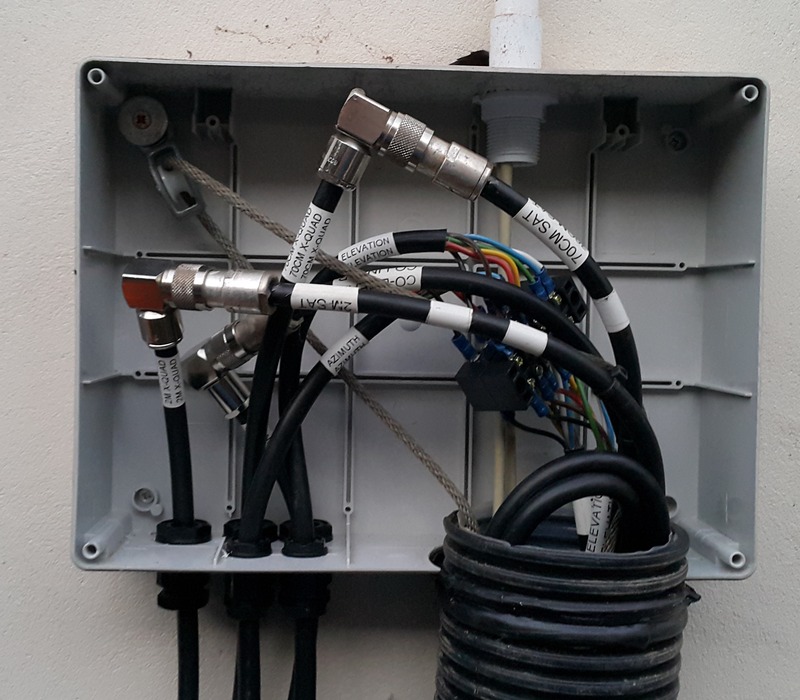 Having planned the location for the sat antennas for some time, on the side of the house, a 115mm cable duct was buried when the shed bases were laid. 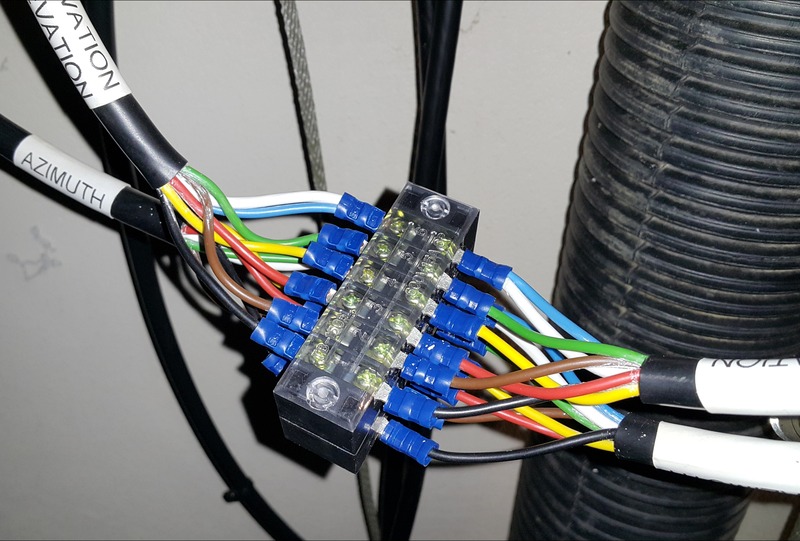 The RF (left) and rotator (right) cables and connections in the duct.. 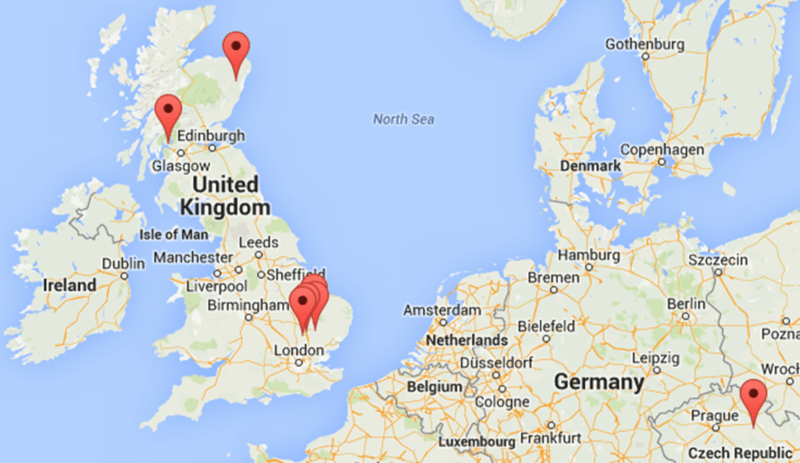 This map shows all the places I’ve lived when I’ve been active on the radio. The point in the NE of Scotland was on CB/11m only before I got licensed. I’m originally from Scotland, in my younger years I lived in Dumbarton but it wasn’t till I lived in Kintore, near Aberdeen, that was where my passion for radio started with the introduction to CB. In my mid teens my family and I moved to Helensburgh (IO76pa) 15 miles west of Glasgow (and 7 miles from my starting point of Dumbarton), which was about when I took my Class B Amateur Radio Exam, it was still the City & Guilds RAE back then. I then spent 2 years working in Pardubice which was 60 miles east of Prague in the Czech Republic, before moving to Cambridgeshire, England where I’ve lived in numerous villages in and around the city, settling in Woodditton. My present, and likely long-term QTH is Woodditton, JO02FE, which is 6Km south of Newmarket, 20Km east of Cambridge and 85Km NE of London. All positions have required a serious amount of travel, the Panasonic role especially, so I’d easily have DXCC from the countries I’ve been to.